Ukraine is in crisis and people fear the Russians may send in troops to calm it down. 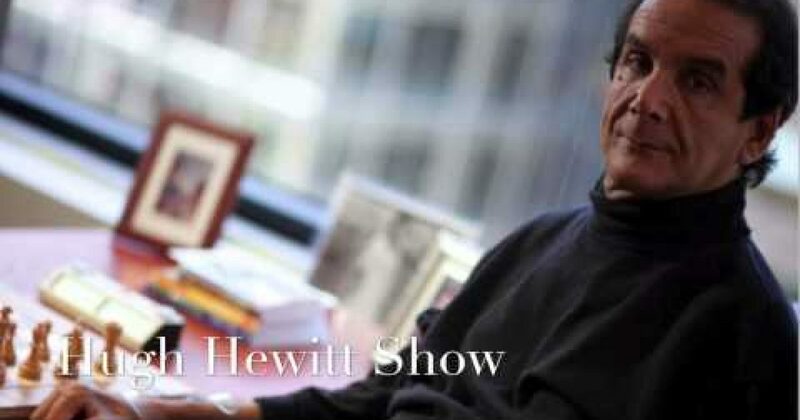 That was the focus of the discussion between Charles Krauthammer and Hugh Hewitt on Tuesday’s Hugh Hewitt Radio Show. Hewitt: Well, what do you think of this? And what do you expect Team Obama to do in response, if anything? Krauthammer: Well actually, I did write about the fact that very early on in 2009, the Obama administration, with its cosmic naiveté, produced this reset with Russia. And we can see now the fruits of the reset. Putin immediately understood he was dealing with an adolescent, naïve in Obama who gave him a victory in Poland and Czech Republic on missile defense, where remember, Obama just jettisoned it as the way to appease Russia, and to show how he was going to play nice, assuming reciprocal behavior. Well now, we’re seeing that reciprocal behavior in the streets of Ukraine. Ukraine is the key to determining whether Putin will succeed in rebuilding a mini Soviet empire. Without Ukraine, Russia cannot do that. With Ukraine, it becomes a mini Soviet empire with Kazakhstan on one side, and Belarus already subdued on the other. And then it puts pressure on Eastern Europe. Putin understands that, which is why he stepped in to prevent Ukraine from concluding this deal with the European Union that would have consigned Ukraine to the West, to freedom, and to democracy, which is what those people are in the streets for. And that’s why they’re getting their heads bashed in. Hewitt: …because Putin precipitated this. He wasn’t dragged into this. Krauthammer: Right. Yeah, that’s like saying Russia was dragged into the invasion of Hungary in 1956. Krauthammer: Yeah, well, that’s not how it works. Of course, you’d expect that from a newspaper that famously had a correspondent in the 20s and 30s who praised Stalin, praised Lenin and then Stalin, Durante, and who was famously found to have been a fabricator. But let’s not accuse them of going that far. Dragging is not the right word. Obviously, Putin is the one who instigated this. He engineered the turnaround. And it’s basically rather simple. Ukrainian people in the majority, not all of them, some of them are Russian speaking and have some affinity with Russia, but in the majority, they want to join the West, even in the Russian speaking areas. This is where the weakness of the current president was exposed, because that’s his base. But in some of the Russian speaking areas of the city, they have been anti-government demonstrations and takeovers. So this is a president whose support is crumbling. But he is very strongly supported by Putin, who just a day or two ago released part of an enormous loan as a way to purchase Ukraine the way Jefferson purchased Louisiana. And we are doing nothing.